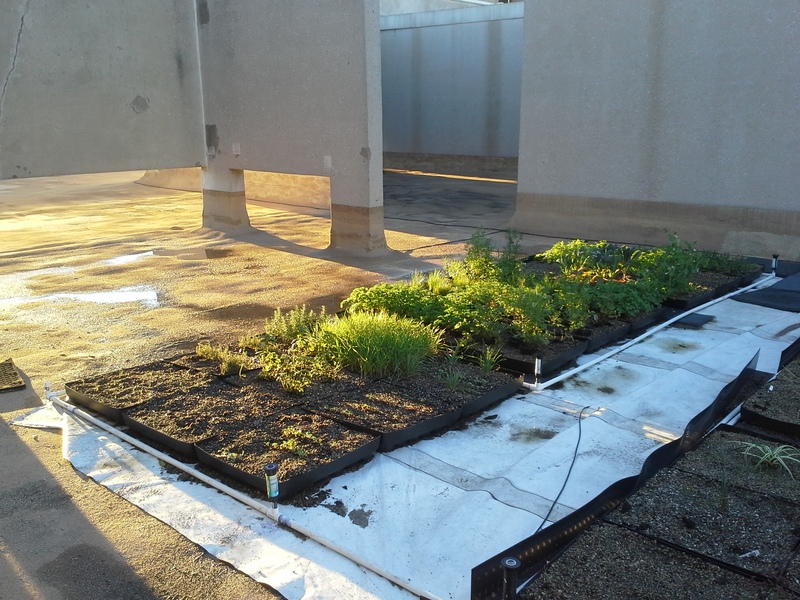 As Fall 2015 on the Texas A&M Green Roof drew to a close, there was still much to accomplish. 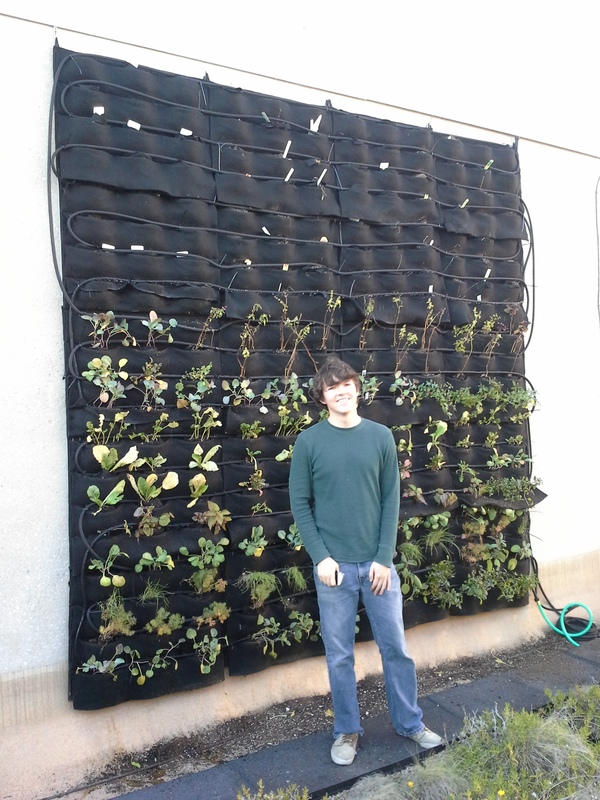 The Northern Green Wall needed 132 plant pockets filled as well as 100 additional feet of hose. This was easier said than done since all of the pockets were still filled with old soil from the spring semester, one team member was ill, and we were without Dr. Merrill’s usual voluntary assistance. After three months, our team was used to working together and it didn’t take long for everyone to position themselves so as to best contribute to the effort. Undergraduate student Sam Hudson had taken an interest in the roof’s irrigation systems early in the course and had quickly become our irrigation expert. Sam had proposed the concept of the soaker hose system which was ultimately installed and it was doubtful that he was going to let the semester end without seeing it through to completion. Graduate students Chenni Zhu and Tiantian Lyu worked as efficiently and diligently as always by wrapping all of the new plants in cloth “diapers.” While the diapers are an additional bulky layer, they greatly increase the ease with which plants can be replaced as we discovered in pockets from last spring which had been planted without a diaper. We had to scoop the soil out of those pockets, which was messy and slightly difficult as installation heights increased. Being the fortunate one to perform this task, I found a silver lining in the fact that we had conserved 16 gallons of old soil by the time it was completed. With 10 minutes to spare in our final day, we had installed 100 feet of hose and 132 plants. We removed 16 gallons of soil and disposed of 64 gallons of waste. As the sun began to set on our last green roof class, I was a little sad. 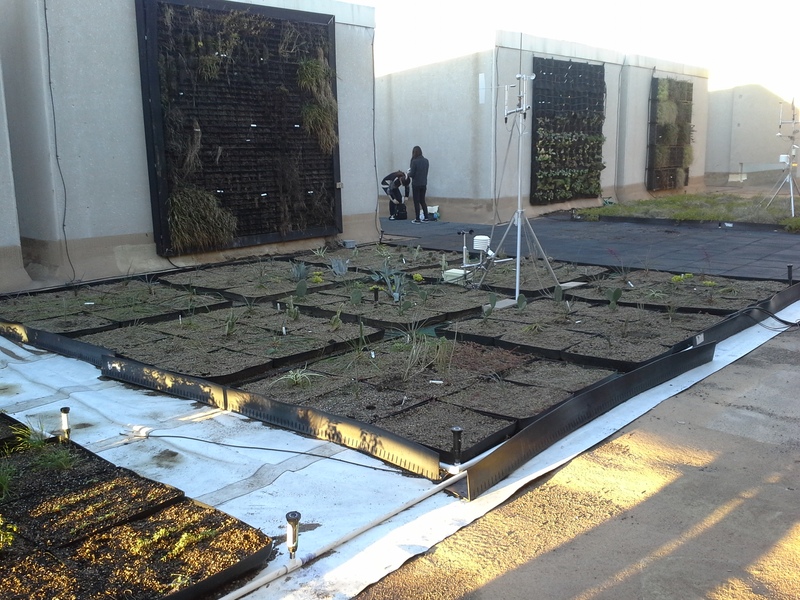 The Green Roof is our last class of the week, but its also the most rewarding. Although we all receive course credit for our effort, the true reward of working on the green roof has been the ability to see and touch the fruits of our labor at the end of each day. The work is alive and contributes to our faculty’s research of more efficient ways to provide food, insulation, and beauty to the built environment.